Occupied Jerusalem, ALRAY- Israeli settlers, and elements of the occupation intelligence stormed on Monday morning the courtyards of Al-Aqsa Mosque from Mughrabi gate amid tight security of the Israeli police. 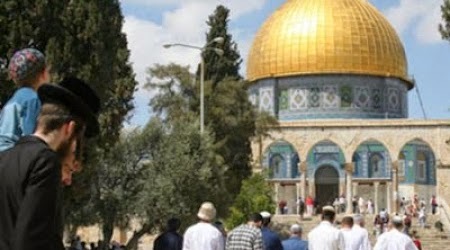 Media coordinator of the Foundation for Islamic Waqf in Jerusalem Firas al-Debes told "ALRAY" that 15 settlers spread over two groups including 6 elements of intelligence stormed the Al-Aqsa courtyards. Al-Debes pointed out that the Palestinian worshipers confronted incursions’ settlers, and prevented them from performing religious rites and prayers of Talmudic within Aqsa. He explained that the Israeli police seized the personal cards of a number of worshipers within Aqsa in an attempt to crack down on them. Al-Aqsa Mosque is witnessing almost daily series of incursions and violations by settlers and Jewish extremist groups amid tightening the noose on the Palestinian worshipers, especially women. Not respecting places of worship is a common practice of atheist Zionists. They can put on their cute little bald spot cover and have dread locks dangling down but it does not change the FACT Zionists are the problem of Israel and America!.